Improve the handling and ride quality in your Jeep Wrangler JL with Rancho Adjustable Control Arms. These heavy-duty suspension arms allow you to precisely set your caster and pinion angles. Rancho engineered their Adjustable Control arms to reduce noise, vibration and harshness (NVH). The upper arms are adjustable on the vehicle. Both upper and lower control arms feature Rancho’s D2 bushings in forged ends. They are compatible with both two and four door JL Wranglers with up to 4.5 inches of lift. 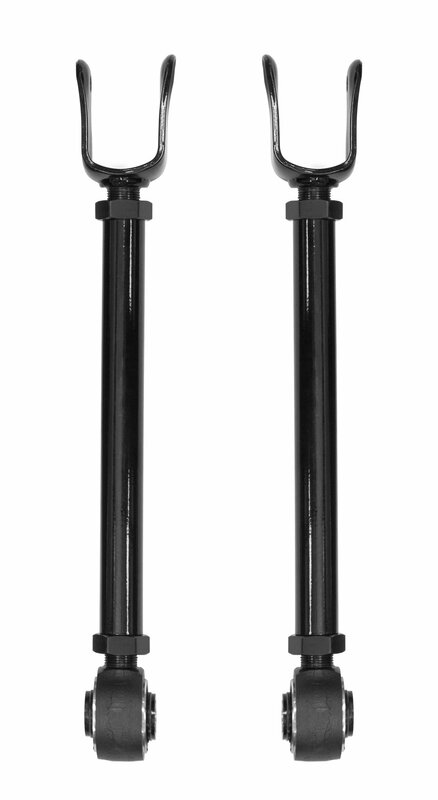 Heavy Duty Construction: Rancho uses rugged .188 DOM wall tubing with forged ends. The upper arms are made from 1.25” diameter tubing, and the lowers are 2”. D2 Bushings: Rancho’s synthetic PFTE Teflon D2 bushings are self-centering, high-articulating, grease free, and fully re-buildable. Versatile Application: These adjustable control arms can be used on any JL Wrangler from stock to up to 4.5” of lift.